The Iron Fleet has gathered near the rugged and windswept Isle of Pyke. House Greyjoy means not only to claim independence for the Iron Isles, but to take the wrath of the sea to the shores of Westeros itself. To show its green-blooded nobles the power of salt and iron. To once more make them fear the sails of the Great Kraken. 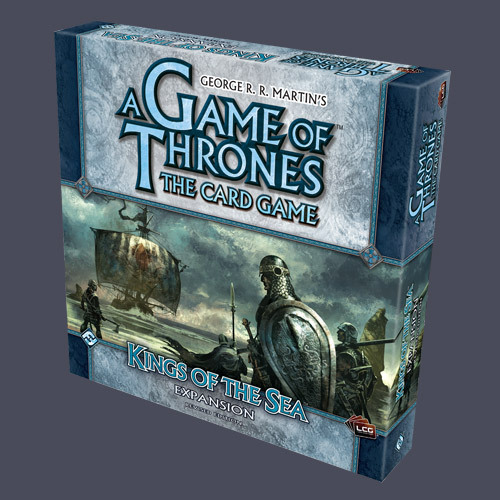 In the Kings of the Sea expansion, House Greyjoy makes its true mark on the A Game of Thrones: The Card Game. This 180 card expansion (three copies each of 60 unique cards) provides the cards youâ€™ll need to make House Greyjoy decks a reaving force to be feared. Included, among others, are Euron Crows Eye, Aeron Damphair, Asha, Theon, and Balon Greyjoy, beloved characters from author George R.R. Martinsâ€™ A Song of Ice and Fire. With them comes a wealth of new strategies, tactics, and deck-building options. The Kings of the Sea expansion also features â€œThe Kingsmoot,â€� a multiplayer variant in which players compete for the support of the Iron Islesâ€™ chieftains. Note: this reprint of Kings of the Sea does not include a resin House card.